Faith, social justice and contemporary life through the lens of a Lutheran pastor. Just got done meeting with Bishop Younan and it was a fantastic experience... He talked about how between now and April is a key moment in the Palestine/ Israel peace process because whether or not Secretary of State Kerry succeeds in negotiating a two-state solution is going to have far reaching consequences. Bishop Younan also talked a bunch about the idea of accompaniment, that instead of the old missionary we should have a relationship of mutuality, where we share and learn from each other. He specifically said in fact, "accompaniment is the strength of the modern church." Given how much I've learned from our meeting today, from the other ELCJHL folks we've met with (both clergy and young adults), and other groups here as well, Bishop Younan's statement couldn't be more accurate. The strength of the ELCJHL's young adult program for instance is amazing... if young Lutheran adults throughout the West Bank can be brought together regularly for regional conversations despite a myriad of checkpoints, barriers and other difficulties, perhaps there's a model there we in the ELCA could learn from. Most importantly though was something Bishop Younan said about pilgrimage and what pilgrimage can mean to those folks who come from a secular context (like my own up in New England). Speaking specifically about groups who come from Scandinavian countries and other secular areas, he said "many people in the Lutheran world are seeking pilgrimage and to find God. People are asking why they are living." This statement really pulled on my heart strings. Throughout seminary as I've learned about how the gospel, the good news of God's work in Jesus is supposed to free troubled consciences, redeem one's soul, and stuff like that, such a message has never really hit home. I frankly don't think about my soul very much at all. I remember when I was a kid seeing scary History Channel shows about the end of the world in the year 2000, I was worried about my soul, but I don't think I've thought much about it since. I pretty much just assume my soul will be rejoined with God in some sort of heaven and I'll be fine. I think most of my clergy or almost-clergy friends feel the same way I do, because I very rarely hear much about souls being redeemed in most Lutheran sermons. I do hear though a lot about how God loves me, no matter what... it seems like we've either unconsciously or semi-consciously arrived at the idea that God's universal love is the gospel, the good news of what God does in Jesus. Now this is an idea that does help me out, sometimes, but not often. And when I talk to folks my age, most of whom aren't religious at all and have a lot of problems with the Church, and tell them that God loves them no matter what, they generally kind of like the idea that I don't think God hates them for living with their significant others or voting for Democrats, but it still doesn't mean much. What Bishop Younan said about existential meaning, about people asking why they are living, that really got me thinking about how I experience the gospel. When I'm told God forgives my soul, it doesn't mean much. When I'm told God loves me, that means a little something to me, but isn't news that would wake me up on a Sunday morning. There's definitely folks that such ways of framing the gospel mean a lot for, and I'm not saying we should entirely drop such language. But the idea that God is calling us, propelling us into a life of meaning in relationship with Her and Her creation? Hell yeah, that's really good news! The idea that God gives me something to do, the idea that I'm not a random assortment of atoms with little purpose, that's a truly liberating word for me, that's gospel. I also think that's the sort of gospel all folks are looking for, especially us millennials, it's the sort of gospel you definitely experience on pilgrimage to Palestine, and it's definitely the sort of gospel I intend to preach moving into the future. 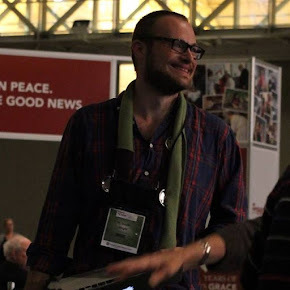 Dustin is currently in his final year of a Masters of Divinity program at the Lutheran Theological Seminary at Philadelphia, having recently completed a year as Vicar at the Lutheran Office for World Community and Saint Peter's Church in New York City. While seeking ordination in the Evangelical Lutheran Church in America, his focus is on the intersection between worship, service and justice in de-centralized faith communities unencumbered by a traditional church building. In his free time, Dustin likes playing frisbee, hiking and pretending to know how to sing. Hey friends! I'm pastor of Messiah Lutheran Church in Schenectady, New York, the city that powers the world! I use this site to post sermons, devotions, reflections and academic work. Thanks so much for reading, and please, keep in touch! Jesus is a Goofy Sort of Gardener! How Then Can We Live? Chief Priests, Pharisees and Professional "Perfect People"